May 1st was not only May Day but also marked a decade since the famous Mission Accomplished speech meant to signal the end to major hostilities in the Iraq War. 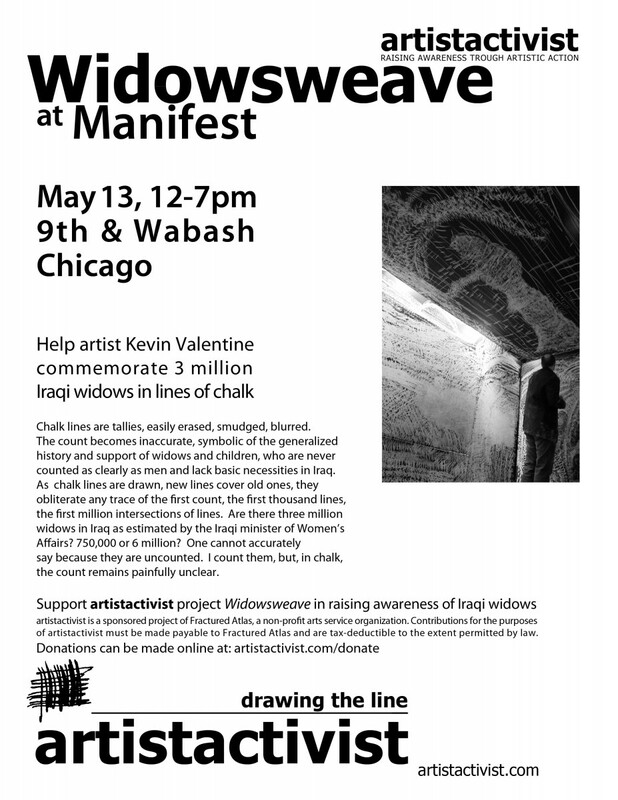 As continued strife in Iraq and its resultant neglect of issues relating to women and children keeps Widowsweave relevant, Valentine is starting a new commitment to this project. Beginning May 1, 2013 and continuing for one year, he will record 3,000,000 meters of running in an effort to engage more people in the discourse surrounding Widows in Iraq. 3 million meters, or 3 thousand kilometers is equal to about 1,660 miles. Running for a cause has become an excellent tool in fundraising for charity across the globe. The hope is to fundraise for charity that can benefit Iraqi Widows in some way, though this project has proven that goal to be as elusive as peace in Iraq. I am currently exploring fundraising for charities already listed on this site, plus Women for Women International. More details to follow. 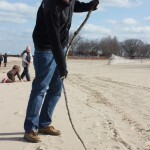 On May 1st, I ran 7 miles (11 1/4K) – and also marked the day by drawing another 1000 lines in the sand at the Lighthouse Beach in Evanston. Today, I added 6.5 miles for a total of about 21 3/4K so far. I am hopeful that this new initiative will propel the Widowsweave project forward. Kevin Valentine and Grant Grieshaber marked the 10th anniversary of the beginning of the Iraq War on March 20th by drawing a line in the sand – or rather 2000 lines in the sand to add to the total of lines drawn in Valentine’s Widowsweave: Lines in the Sand project commemorating 3 million widows in Iraq–a number estimated by the Iraqi Minister for Women’s Affairs on International Women’s Day in 2009. 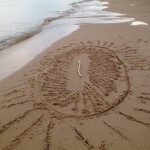 To date, the Widowsweave: Lines in the Sand series of performances has drawn a collective 486,072 lines in the sand around Lake Michigan in Illinois and Michigan, on the Mississippi River, at Principia College,Illinois and in Hartland Quay, Devon, England. March 20th will be the 10th anniversary of the Iraq war – the US/UK forces have left, but the fighting continues. How should I commemorate this sad decade of conflict? Here’s the link to some videos that Ramah Jihan Malebranche and I made for FSG on Collective Impact – the concept that it takes many organizations coordinating over time to make change on a large scale. Check it out, pass it on, like or just enjoy. 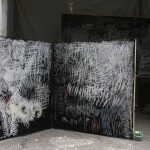 Two acrylic works are being exhibited through September 1st at the Columbia College Chicago Library, 624 S. Michigan, Chicago. Low Estimate, Panel 1 & Hope and Despair are on display on the 5th floor of the Library from April until closing in September. 100 lines were drawn in the sand on March 12, 2012 on the beach at Gillson Park, Wilmette, IL to commemorate Iraqi widows for International Women’s Day (a few days late). 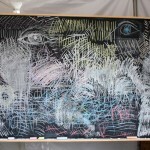 Approximately 120 participants commemorated Iraqi Widows with 13,989 lines drawn in grids, pictures and messages on a chalkboard, two large panels and the asphalt at Manifest 2011. 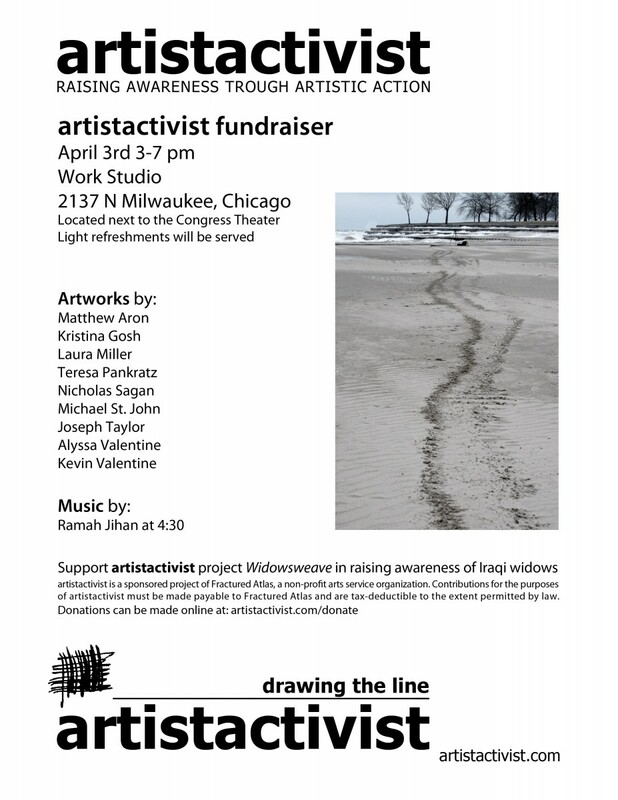 Add your mark – Draw chalk lines for Iraq’s widows – on chalk boards and on the pavement. Receive a free Keychain or Dogtag for participating.